Wing Farms is great, too! While I was there, another customer almost came to blows with the farmer b/c her dog wasn't allowed in. She's all, "He was so excited!" Like seriously? Like the dog knows? Needless to say, I hobbled my broken foot over in case there was a throw down (I was totally with the farmer) but the lady just stalked off, cussing away. 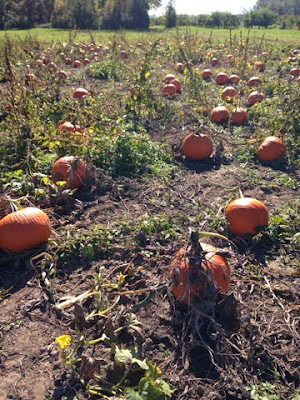 Got four beautiful pumpkins, too!